Days of Our Lives (DOOL) spoilers for Friday, April 6, tease that Vivian (Louise Sorel) will be ready for the next phase of her plan. The first step was hiring Leo (Greg Rikaart) to make Sonny (Freddie Smith) fall in love with him. Since Leo’s already well on his way to achieving that, Vivian will work on her part of all this. She has a few tricks up her sleeve, but she’ll have to be careful. Kate (Lauren Koslow) knows Vivian’s up to something, so she’ll continue to keep at eye on her at the DiMera mansion. It looks like they’ll have another tense encounter on Friday. Kate may assure Vivian that her sneakiness won’t pay off. She’ll make it clear that she’s a formidable foe, but she won’t give away too much. Kate certainly doesn’t want to tip Vivian off to Paul’s (Christopher Sean) snooping. Of course, Vivian feels invincible and that means her risky scheme will press on. Next week, April 9-13, Vivian will visit Maggie (Suzanne Rogers) and Victor (John Aniston) with a goal in mind. She’ll suggest that she wants to make peace, but it’ll really be another ploy. Vivian’s going after Titan, so DOOL fans won’t want to miss all the shockers she has in store. In the meantime, Days spoilers say Leo will have big news for Sonny. What kind of updates will he pass along? Will Leo want to become exclusive? He’s doing everything he can to make Sonny believe he’s head over heels, so he’ll have to make a bold move. 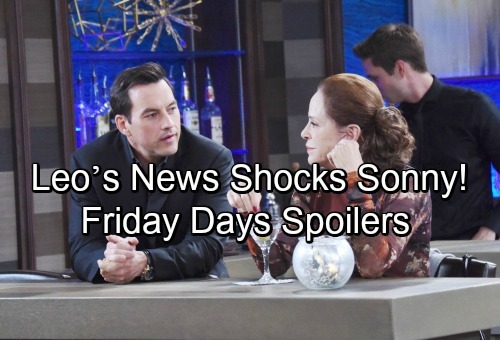 Days spoilers say Leo will also meet Justin (Wally Kurth) and Adrienne (Judi Evans) in Friday’s episode. They might catch Leo leaving after his romp with Sonny upstairs. Adrienne and Justin will do their best to ignore the awkwardness. They’ll hope to get a better sense of what Leo’s like and see if he’s a good match for their son. Other Days of Our Lives spoilers state that Gabi (Camila Banus) will be a nervous wreck. As she waits for her verdict, Gabi will explode at Abigail (Marci Miller). She’ll think all the bogus confession drama could land her behind bars. Unfortunately, Gabi’s right about that. A guilty verdict is coming up on Monday, so stay tuned for Gabi’s heartbreak. We’ll keep you posted as other Days of Our Lives details emerge. Stick with DOOL and don’t forget to check CDL often for the latest Days of Our Lives spoilers, updates and news.